Bugs are a large group of insects which includes many pests of plants. There are however many bugs that are important predators of other insects. 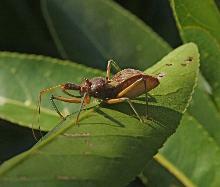 They range in size from the minute Orius to the ferocious Assassin bug. They undergo a gradual metamorphosis usually through five instars in which they shed their skins in a series of molts until adult hood when they develop wings. Unlike beetles there is no pupal stage. 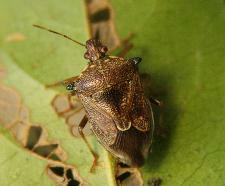 Minute Pirate Bugs - Orius spp. 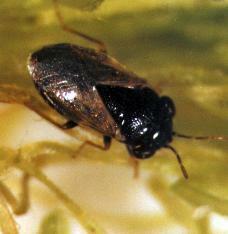 The tiny predatory bugs (about 2.5 mm long) predominately black with light wing patches, are found in many crops. Their tiny eggs are rarely seen as they are laid singly into plant tissue. Nymphs are yellow-orange or brown tear shaped (top right). 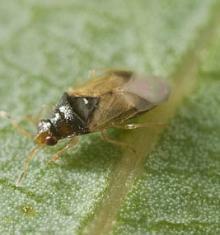 Orius feed on Heliothis eggs, thrips and may feed on Dried Fruit Beetle eggs and larvae. They are first encountered in the tassels and then in the silks. These are major predator in some areas. What constitutes a significant number is unclear but current studies indicate that two per silk in sweet corn will have a significant impact on a moderate heliothis egg lay. Big Eyed Bugs - Geocoris spp. and Germalus spp. Key identifying characteristics: They are broader and slightly larger than Orius at about 3 mm long and distinguished by their very large eyes. Significance: These bugs are not nearly as abundant as Orius in the Lockyer Valley but are found in most crops. Key identifying characteristics: adults slender, about 8 mm long, pale brown, narrow head with large eyes and long antennae. They are a fast moving general predator which feeds on moth eggs and small larvae. In the pre tassel stage of corn they are often seen in the whorl, then the tassel and latter around the cob and silk area. 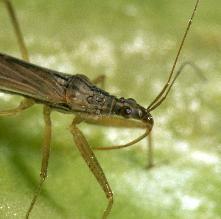 Significance: Damsel Bugs were very common in corn in the Lockyer Valley SE Qld- at times close to one per plant. They are important predators in vegetable crops especially brassicas where they feed on cabbage moth larvae. 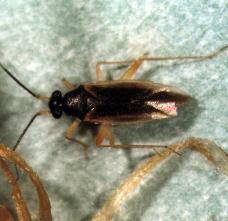 Damsel bugs are mass reared - more info. Primary Hosts are moth eggs. 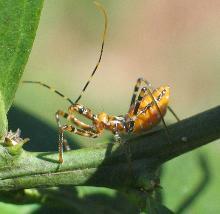 Adult, about 4 mm long, fast moving, dark bodied, pale legs, relatively large eyes, long antenae. Significance: very common and significant in some crops and growing areas. Horn like protrusions, shield shaped body with overlapping wing tips, extended mouth parts. Very common in some areas while absent in others. They are voracious feeders and attack even large grubs. 12 to 18 mm long, curved beak is held beneath the narrow head. Long front legs for grasping its prey. 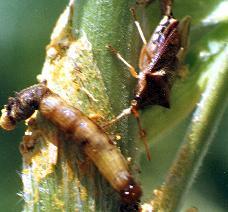 Sometimes seen in corn crops but not as common as the other predatory bugs mentioned above. More common in tree fruit crops.